Dose/Strength (ex. 1 mg or 1ml) 2 Capsules in a day, once before lunch & once before dinner. We are actively engaged in offering a reliable assortment of Antioxidant Capsules. 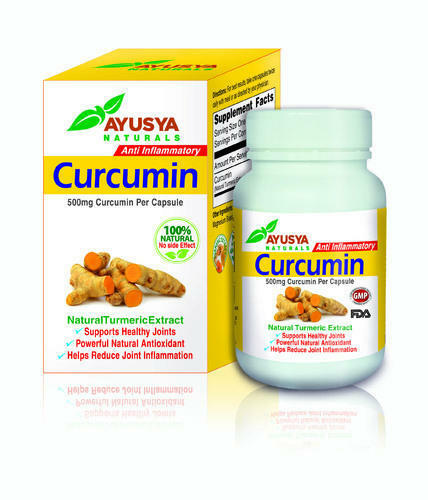 Ayusya Curcummin Plus Best Antioxidant (30 Caps), which are highly useful in treating arthritis, allergies and diabetes. This capsule is formulated using pure and natural chemical compounds which result in effective results. These capsules are stringently tested to ensure non toxicity and purity. Ayusya Naturals Pvt. Ltd., a private limited company, started its business in the year 2012, is one of the distinguished manufacturers, suppliers and retailers of a various range of Joint Pain Oil, Herbal Heart Juice, Immunity Control Juice, Antioxidant Capsules,Dermadron Juice, Hair Oil, Nector daibetes relief Capsules, Wheatgrass Juice, Medex weight loss Capsules, Soursop Juice and Zing Capsules, Shampoo, Wellness Tea. Our comprehensive assortment of high quality natural solutions is processed using qualitative, pure chemicals and other ingredients after checking for purity and non-toxicity. We always try to upgrade our facilities, technologies and products in order to stay at the forefront of our competitors.